Thanks for the info. I'm very satisfied with the Hammerheads and plan on sticking with them. Yeah, If I can get these to shoot I'll probably cast up 100 more and then sell the mould.. These would be for extreme cases as nobody needs to shoot 690 gr boolits very much. I've got plenty of other slugs that I can shoot from the Lee to Lyman Sabot to Pumpkin Balls to the STI Hammerheads, Thug Slugs AQ's Etc.. More than enough to keep me busy forever. Bought this mould as moment of weakness, and I have to say as a machinist that it is nicely made. W.R.Buchanan wrote: Yeah, If I can get these to shoot I'll probably cast up 100 more and then sell the mould.. There is 3 MOA accuracy and there is "Usable Accuracy." 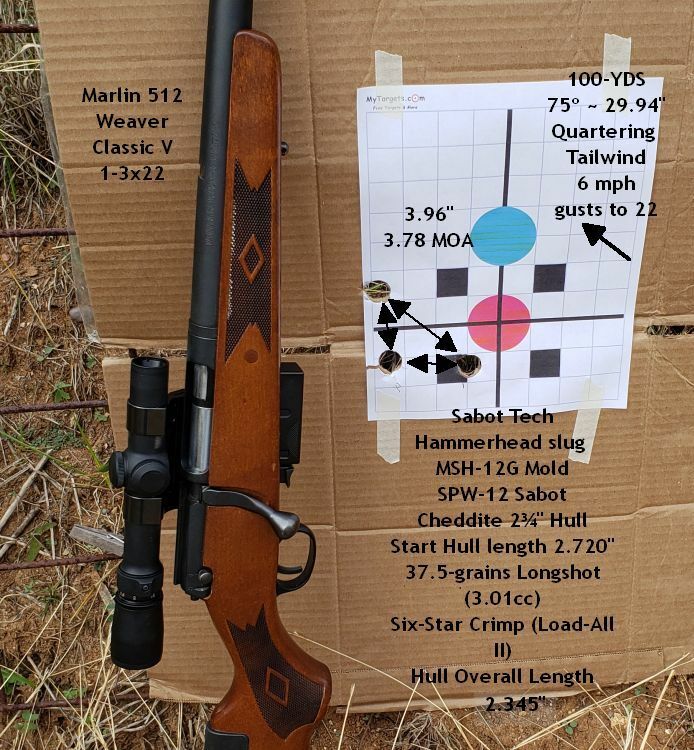 Mike wants his Marlin 512 to shoot 3 MOA or less consistently for hunting purposes. My Mossberg 500 Tactical Gun with rifle sights shoots Fed Low Recoil Slugs. (.70 each) into 2-2.5" at 50 yards which is as far as I need it to shoot. For shooting at Front Sight Shotgun Classes this is the way to go as they don't allow any Reloaded ammo there at all, and .70 cents a round is not the end of the world.. It also shoots Pumpkin Balls that I load in my Trap Loads into the same size groups. And if I am going to burn up 20 or so on a Shotguns Stage at a 3 gun shoot in 2 minutes that is a economical way to go that works for that purpose. It is also fun to play with this stuff which is half the reason we do it in the first place. I recently acquired a Browning A5 and a Smoothbore Slug Barrel and Hastings Rifled Barrel for the gun as well. I have the STI slugs as well as a bunch of others to start testing to see if I can get Consistent and Acceptable accuracy at 100 yards out of that gun. The problem with getting super accuracy out of homemade slugs is getting them cast right. These are large diameter boolits, and as such if they have any irregularities in them at all they are out of balance radially and they just won't fly strait. However that doesn't mean they won't deliver "usable accuracy." I bet I can hit a Black Bear at any distance inside 50 yards every single time with just about any "usable" Slug. Obviously it has to deliver some kind of consistent accuracy but beyond that, even 6" at 50 yards would do the job. I have the STI Slugs that Mike talks about and they look like they will be a good answer. I live in California (don't hate me, I didn't vote for them!) so I can't hunt with any Lead Projectiles. I can however turn Brass Inserts for the STI Sabots and have a legal round for Hunting Pigs. Today is the first day I have had due to weather, to get to my Range and shoot my new gun. I have a bunch of ammo I have loaded. The majority of what I have loaded uses my standard Trap Load of AA hulls Win 209 20.5 gr of Green Dot and a Blue Claybuster wad. These are very low pressure rounds and are designed for 3 gun shoots. I will be shooting Both my M500's,,, and the Browning A5 for the first time. I will post pics of targets when I get home. OK I got to shoot the A5 yesterday at some targets placed at 50 yards. My intention was to create some kind of baseline for accuracy using Federal Low Recoil slugs which I have to use at Front Sight. Only shot the Smoothbore Barrel with open sights. I had bore sighted it with a Wheeler Laser the night before, but the first 3 shots were 12" high, so after correcting the elevation I shot this 3 shot group. It measured 1.5 x 1. I tweaked the rear sight to the left a little after this group. Shot at 50 yards. I then shot a few of the Lyman Slugs I first loaded months ago and they were all over the place. I know I can get them in the ball park with proper wads, support and new hulls, as these were loaded before I knew anything about loading slugs. I also shot a bunch of my Pumpkin Balls which are loaded right into my normal trap loads by replacing the shot with a 1/4" felt wad and a .662 ball. These shot well enough to plink with, which is what they got used for. I hit some clays at 25-50 yards and missed some at 100. Still need to shoot up some of my junk loadings so I can get them out of the way so they don't get mixed in with the good stuff . I got some Lightfield Slugs to shoot from the rifled barrel and they should be the best, and I will use them as the control group for accuracy for the Rifled Barrel. There's some Brenneke's in the mix as well and they can be shot in either barrel. Lots of things to test. That is a great group. I know our needs are different, but about 65 to 75 yards seems to be where things go wrong if the stars are not aligned. I have had some fliers with the Hammerheads and I think it is premature sabot separation. I need to get back on this stuff but just haven't had the time. We had a front roll through Saturday night, like the rest of the country, some really nasty weather. My brother in law was visiting, we were at our house watching the races, and the gals were at the guest house doing their thing. I told my BIL that these fronts were coming on a three-week cycle and that I bet a big nasty hog was out at the feeder. This 275 ~ 300 beast only appears in nastiest weather, no time else. I get up and look out and sure as chit; he is out there. So we end up watching him for an hour because the races have become like watching wet paint dry. We talked about shooting it, but his eyes are too bad, and I'm not going to kill anything until I'm done with the Marlin 512 work. Done and settled, I'm not going to take another miss or flyer. So, with the BIL, I finished up some 100-yard shooting yesterday, and I'm comfortable with the STI at that range with my 512. I was going to work on some changes for my Rem 600 35 Rem, but I want to get this slug gun stuff done. It looks like we will have another frontal crossing on Wednesday evening so who knows. 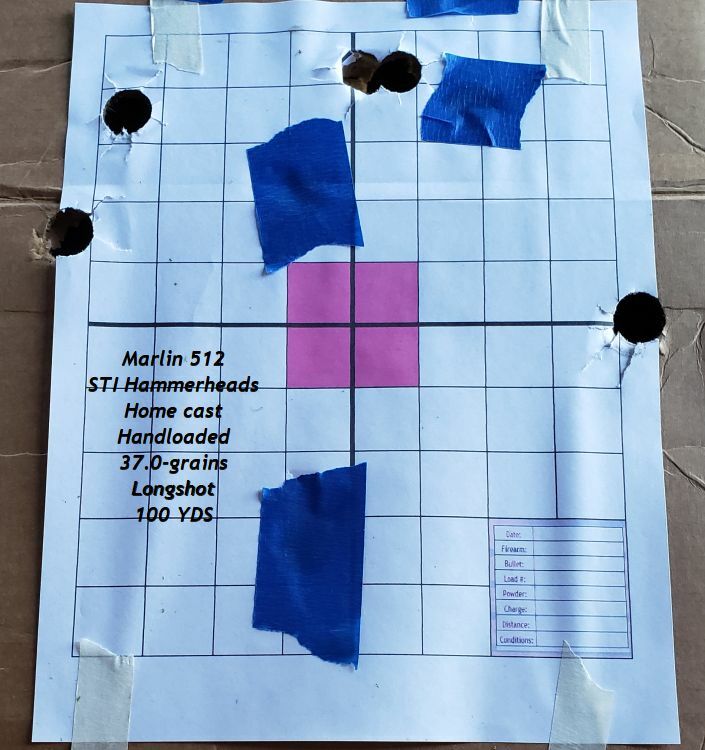 So what kind of groups are you getting from the STI slugs at 50/100 yards ? I haven't gotten to shoot any thru my Rifled Barrels yet, but have about 60 of them ready to load and another 10 of the brass ones ready as well. I will use the new RIO Hulls I got from BPI as they Roll Crimp perfectly and are too cheap at .11 each ready to load to mess with used hulls. I loaded 2 STI's into clear RIO Hulls Saturday and they crimp so nice. Hopefully they will shoot well. Have you gotten your MEC Slugger sussed out yet? It should make short work of loading the STI slugs. W.R.Buchanan wrote: So what kind of groups are you getting from the STI slugs at 50/100 yards ? Minute of target paper. This is what was shot on Sunday. From 50-yards to 100, the groups open up. W.R.Buchanan wrote: Have you gotten your MEC Slugger sussed out yet? It should make short work of loading the STI slugs. Funny you should ask. It is a nice press but a bit tough to adjust when moving to different column stack heights within the hull. I am thinking about going back to the Load-All using the six-star crimp. If I need to adjust the column stack up, I will use BPI Filler between powder and pressure wad. If the stack is too high, I will trim 3" hulls back. I haven't had any issues with using the Load-All with a non-standard hull length (2¾" or 3"), it is easy to use a card wad(s) between the press's base and hull to resolve the proper height. I'm not giving up on the roll crimp, mainly as applied by the Slugger, but holes downrange speak. My trouble with the rotary roll crimpers are that the hulls are unusable after the shot.